As we dive into 2017, we wanted to take a look back at some of the best shots taken by many of Austin’s most talented photographers over the past year. 2016 may have had more than its share of ups and downs, but something we can all certainly get behind is gorgeous photos taken of our incredible city. 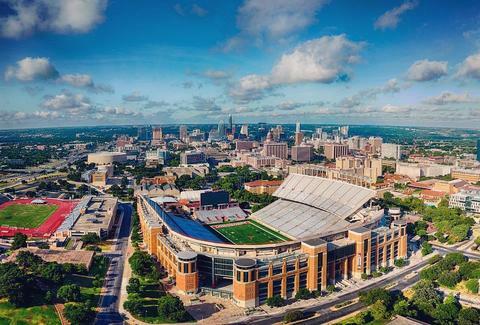 If a picture is worth 1,000 words, you’re looking at about 20K solid reasons why it’s great to be alive in Austin, Texas. Sometimes Lady Bird Lake (Town Lake) feels like the great and slowly beating heart of our city. It bears witness to countless moments big and small. Runners, lovers, families, cyclists, raucous concerts, and quiet nights with barely a breeze. It reflects a piece of every part of us. Austin’s iconic 69-degrees-all-year-round, naturally fed swimming pool. It’s a place to read and swim and gab and relax with the sun on your face and a smile in your heart. Just don’t look too closely at the dude sunning himself on the hill. Eek. When FunFunFunFest said its sad goodbyes, we were pretty devastated. But then Sound on Sound came through and blew us away with the lineup, location, and incredible sound. It’s so like this city to evolve in a spectacular way. Dog-friendly patios, dog-friendly parties, and just plain, all around dog-friendly, one thing is clear: Austin loves dogs. As the largest no-kill city, it’s small wonder that so many Instagram pics are of our beloved four-footed friends. Zilker Bark does a beautiful job of capturing doggy joy in its purest form. Austin is teeming with plenty of great street art -- on buildings, inside offices, on homes, and onsite live demos. The HOPE outdoor gallery seems destined for a new location sometime in 2017, but for now, there’s still plenty of art to explore. Where all the lights are bright. Downtown is still the hub of all things hip and hopping. New bars, new buildings, new buzz abound -- though parking, sadly, does not. The Downtown skyline is one of the most photographed spots in the city (second only to the “I love you so much” mural). Bit by bit, the weird and wonderful is disappearing. The quirky character of South Austin fades as mega mixed use and condos with “clean lines” take over. The Bottle House Gallery, along with End of an Ear records, Amelia's Retro Vogue & Relics, are part of Old Slackerville and will soon be replaced by a storage facility. A centerpiece of Austin’s skyline, the Frost Building was among the tallest buildings in the city when Downtown was less developed. Rumor has it that building looks like an owl because it was designed by a Rice University graduate -- but that’s a pernicious rumor. The Continental group has brought us some of the best up-close-and-personal music venues in the city. Continental Club, Continental Gallery, & C-Boy's. Head there to see OG Austin artists like James McMurtry, Toni Price, Dale Watson... and then randomly be there the night Johnny Depp drops in for a jam. Aggressive squawking notwithstanding, peacocks are one of the most glorious creatures. How lucky are we, then, to have an entire park of them? Mayfield is beloved by brides but is accessible at any time if you feel like having a little photo sesh with our fine feathered friends. Pro tip: Take a hammock. The Trail of Lights is a longtime holiday tradition. It’s a time for bright sparkly lighted displays, hot cocoa, spinning under the giant tree, and thrusting yourself forcibly into the Christmas spirit. Grinch, be gone! Texas Fiiiiiiiiiight! There’s no place on earth (thank goodness) that you’ll see as much burnt orange worn unselfconsciously. Though the town has grown way beyond its original “college town” status, there’s no denying the University continues to play a significant cultural role. If this picture doesn’t send you into Stage 5 meat sweats, you’re not drooling hard enough. In recent years, the Salt Lick has a ton of smoky competition in town but they’ve got the picture perfect BBQ ‘Gram game on lock. Tucked away off Academy Dr, St. Cecelia provides an oasis of calm and this highly photographable pool. Despite its tiny footprint, the pool (and this soul sign) have become part of the fabric of the south congress and Austin vibe. It tugs at us in some inexplicable way. One of the best things to do when it’s not 100+ degrees outside is lose yourself in the greenbelt. Countless watering holes to swim in, trails to hike, and limestone cliffs to climb (for the more adventurous) make each day a choose-your-own-adventure. Though it’s not actually illegal to pick a bluebonnet, you best not be caught with a bouquet. Our state flower is as beloved as it is legendary. Come springtime, social feeds are awash with families carefully squatting among these blue and white beauties. Because of the generally progressive nature of this fine city, Austin’s long been known as the blue part of our red state. On this night, however, it was quite definitely the rainbow part of our red state. It wouldn’t be Christmas in Austin without a sighting of our favorite Sixth St cowboy. No matter if you’re a longtime resident or a visitor, Santa on horseback ordering coffee will always bring joy. Ask a local and chances are they haven’t been inside the capitol. It’s such a part of the fabric of Downtown that we don’t think about entering those hallowed halls. In addition to being the seat of government in Texas, it’s also really beautiful. Free guided tours happen regularly on weekdays. Each year Austin makes it somewhere on the fittest city list... and each year it’s a surprise. With SO much incredible food (pizza and burgers and BBQ, oh my! ), tacos still seem to win the battle for “food you can eat all day, errrrr day.” Breakfast, lunch, dinner, and late night.